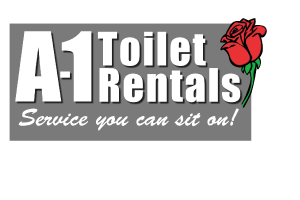 A-1 Toilet Rentals was purchased by brothers Rick and Dennis in 1990. In 2014, when Dennis retired it was a natural progression for Rick, his wife Verna and their 2 adult children, Amy and Paul to purchase Dennis’ half of the family business. 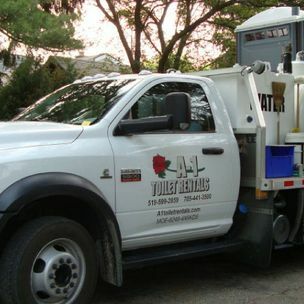 During summer breaks from secondary and post- secondary education, Paul and Amy occasionally assisted their Dad’s truck giving them a good concept of the amount of work involved and quality of service expected by customers and their father. Paul has worked full-time with the business since 2005 and is a graduate of Fanshaw College. Amy has a Business Degree from Guelph University and along with her mother Verna brings many combined years of customer service along with office administration skills to the business. They oversee office procedures at the office/shop located in Clarksburg. Rick, a mechanic by trade, and Verna, life time residents of the area live in Meaford where they raised their family and continue to be very community involved in local organizations and events. On a less busy evening or Sunday afternoon, Rick and Verna enjoy time with fellow classic vehicle friends cruising in their “old cars” as well as time with family and friends in their backyard where any extra free time is spent on their gardens. Our company continues to grow and expand having hired two full-time service personnel/drivers to create a full staff as of spring 2014. 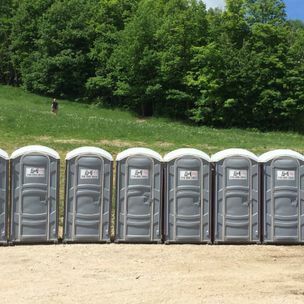 During our busy season, we have 4 trucks on the road daily delivering and servicing portable toilets and sinks. We are committed to going the extra mile for service. 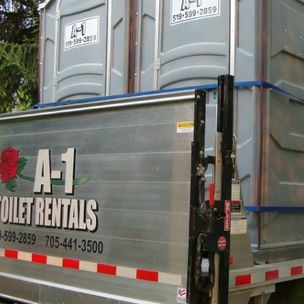 For more information about rental services or to receive an estimate contact us today.